Not to be confused with Zero carbon housing. A zero-energy building, also known as a zero net energy (ZNE) building, net-zero energy building (NZEB), net zero building or zero-carbon building is a building with zero net energy consumption, meaning the total amount of energy used by the building on an annual basis is roughly equal to the amount of renewable energy created on the site, or in other definitions by renewable energy sources elsewhere. These buildings consequently contribute less overall greenhouse gas to the atmosphere than similar non-ZNE buildings. They do at times consume non-renewable energy and produce greenhouse gases, but at other times reduce energy consumption and greenhouse gas production elsewhere by the same amount. A similar concept approved and implemented by the European Union and other agreeing countries is nearly Zero Energy Building (nZEB), with the goal of having all buildings in the region under nZEB standards by 2020. Most zero net energy buildings get half or more of their energy from the grid, and return the same amount at other times. Buildings that produce a surplus of energy over the year may be called "energy-plus buildings" and buildings that consume slightly more energy than they produce are called "near-zero energy buildings" or "ultra-low energy houses". Traditional buildings consume 40% of the total fossil fuel energy in the US and European Union and are significant contributors of greenhouse gases. The zero net energy consumption principle is viewed as a means to reduce carbon emissions and reduce dependence on fossil fuels and although zero-energy buildings remain uncommon even in developed countries, they are gaining importance and popularity. To read about recent examples of newly built houses with zero net energy use and examples of renovated existing houses with a zero net energy use see here. Most zero-energy buildings use the electrical grid for energy storage but some are independent of the grid. Energy is usually harvested on-site through energy producing technologies like solar and wind, while reducing the overall use of energy with highly efficient HVAC and lighting technologies. The zero-energy goal is becoming more practical as the costs of alternative energy technologies decrease and the costs of traditional fossil fuels increase. The development of modern zero-energy buildings became possible largely through the progress made in new energy and construction technologies and techniques. These include highly insulating spray-foam insulation, high-efficiency solar panels, high-efficiency heat pumps and highly insulating low-E triple-glazed windows. These innovations have also been significantly improved by academic research, which collects precise energy performance data on traditional and experimental buildings and provides performance parameters for advanced computer models to predict the efficacy of engineering designs. Energy, particularly electricity and heating fuel like natural gas or heating oil, is expensive. Hence reducing energy use can save the building owner money. In contrast, water and waste are inexpensive. There are well-established means to significantly reduce the energy use and carbon footprint of buildings. These include: adding insulation, using heat pumps instead of furnaces, using low-E double or triple glazed windows and adding solar panels to the roof. There are government sponsored subsidies and tax breaks for installing heat pumps, solar panels, triple-glazed windows and insulation that greatly reduce the cost of getting to a net-zero energy building for the building owner. For instance in the U.S., there are federal tax credits for solar panels, state incentives (which vary by state but are listed here) for solar panels, heat pumps and highly insulating triple-glazed windows. Some states, such as Massachusetts, also offer zero-interest or low-interest loans to allow building owners to purchase heat pumps, solar panels and triple-glazed windows that they otherwise could not afford. The cost of getting an existing house to net-zero energy has been reported as being 5-10% of the value of the house. A 15% return on investment has been reported. See here for details. Despite sharing the name "zero net energy", there are several definitions of what the term means in practice, with a particular difference in usage between North America and Europe. In this type of ZNE, the amount of energy provided by on-site renewable energy sources is equal to the amount of energy used by the building. In the United States, “zero net energy building” generally refers to this type of building. This ZNE generates the same amount of energy as is used, including the energy used to transport the energy to the building. This type accounts for energy losses during electricity generation and transmission. These ZNEs must generate more electricity than zero net site energy buildings. Outside the United States and Canada, a ZEB is generally defined as one with zero net energy emissions, also known as a zero carbon building(ZCB) or zero emissions building(ZEB). Under this definition the carbon emissions generated from on-site or off-site fossil fuel use are balanced by the amount of on-site renewable energy production. Other definitions include not only the carbon emissions generated by the building in use, but also those generated in the construction of the building and the embodied energy of the structure. Others debate whether the carbon emissions of commuting to and from the building should also be included in the calculation.Recent work in New Zealand has initiated an approach to include building user transport energy within zero energy building frameworks. Off-the-grid buildings are stand-alone ZEBs that are not connected to an off-site energy utility facility. They require distributed renewable energy generation and energy storage capability (for when the sun is not shining, wind is not blowing, etc.). An energy autarkic house is a building concept where the balance of the own energy consumption and production can be made on an hourly or even smaller basis. Energy autarkic houses can be taken off-the-grid. The wording “Net” emphasizes the energy exchange between the building and the energy infrastructure. By the building-grid interaction, the Net ZEBs becomes an active part of the renewable energy infrastructure. This connection to energy grids prevents seasonal energy storage and oversized on-site systems for energy generation from renewable sources like in energy autonomous buildings. The similarity of both concepts is a pathway of two actions: 1) reduce energy demand by means of energy efficiency measures and passive energy use; 2) generate energy from renewable sources. However, the Net ZEBs grid interaction and plans to widely increase their numbers of evoking considerations on increased flexibility in the shift of energy loads and reduced peak demands. The building system boundary is split into a physical boundary which determines which renewable resources are considered (e.g. in buildings footprint, on-site or even off-site, see) respectively how many buildings are included in the balance (single building, cluster of buildings) and a balance boundary which determines the included energy uses (e.g. heating, cooling, ventilation, hot water, lighting, appliances, IT, central services, electric vehicles, and embodied energy, etc.). It should be noticed that renewable energy supply options can be prioritized (e.g. by transportation or conversion effort, availability over the lifetime of the building or replication potential for future, etc.) and therefore create a hierarchy. It may be argued that resources within the building footprint or on-site should be given priority over off-site supply options. The weighting system converts the physical units of different energy carriers into a uniform metric (site/final energy, source/primary energy renewable parts included or not, energy cost, equivalent carbon emissions and even energy or environmental credits) and allows their comparison and compensation among each other in one single balance (e.g. exported PV electricity can compensate for imported biomass). Politically influenced and therefore possibly asymmetrically or time-dependent conversion/weighting factors can affect the relative value of energy carriers and can influence the required energy generation capacity. The balancing period is often assumed to be one year (suitable to cover all operation energy uses). A shorter period (monthly or seasonal) could also be considered as well as a balance over the entire life cycle (including embodied energy, which could also be annualized and counted in addition to operational energy uses). Besides the energy balance, the Net ZEBs can be characterized by their ability to match the building's load by its energy generation (load matching) or to work beneficially with respect to the needs of the local grid infrastructure (grind interaction). Both can be expressed by suitable indicators which are intended as assessment tools only. The information is based on the publications, and in which deeper information could be found. The most cost-effective steps toward a reduction in a building's energy consumption usually occur during the design process. To achieve efficient energy use, zero energy design departs significantly from conventional construction practice. Successful zero energy building designers typically combine time tested passive solar, or artificial/fake conditioning, principles that work with the on-site assets. Sunlight and solar heat, prevailing breezes, and the cool of the earth below a building, can provide daylighting and stable indoor temperatures with minimum mechanical means. ZEBs are normally optimized to use passive solar heat gain and shading, combined with thermal mass to stabilize diurnal temperature variations throughout the day, and in most climates are superinsulated. All the technologies needed to create zero energy buildings are available off-the-shelf today. Sophisticated 3-D building energy simulation tools are available to model how a building will perform with a range of design variables such as building orientation (relative to the daily and seasonal position of the sun), window and door type and placement, overhang depth, insulation type and values of the building elements, air tightness (weatherization), the efficiency of heating, cooling, lighting and other equipment, as well as local climate. These simulations help the designers predict how the building will perform before it is built, and enable them to model the economic and financial implications on building cost benefit analysis, or even more appropriate – life cycle assessment. Zero-energy buildings are built with significant energy-saving features. The heating and cooling loads are lowered by using high-efficiency equipment (such as heat pumps rather than furnaces. Heat pumps are about four times as efficient as furnaces) added insulation (especially in the attic and in the basement of houses), high-efficiency windows (such as low-E triple-glazed windows), draft-proofing, high efficiency appliances (particularly modern high-efficiency refrigerators), high-efficiency LED lighting, passive solar gain in winter and passive shading in the summer, natural ventilation, and other techniques. These features vary depending on climate zones in which the construction occurs. Water heating loads can be lowered by using water conservation fixtures, heat recovery units on waste water, and by using solar water heating, and high-efficiency water heating equipment. In addition, daylighting with skylights or solartubes can provide 100% of daytime illumination within the home. Nighttime illumination is typically done with fluorescent and LED lighting that use 1/3 or less power than incandescent lights, without adding unwanted heat. And miscellaneous electric loads can be lessened by choosing efficient appliances and minimizing phantom loads or standby power. Other techniques to reach net zero (dependent on climate) are Earth sheltered building principles, superinsulation walls using straw-bale construction, Vitruvianbuilt pre-fabricated building panels and roof elements plus exterior landscaping for seasonal shading. Once the energy use of the building has been minimized it can be possible to generate all that energy on site using roof-mounted solar panels. See examples of zero net energy houses here. Zero-energy buildings are often designed to make dual use of energy including that from white goods. For example using refrigerator exhaust to heat domestic water, ventilation air and shower drain heat exchangers, office machines and computer servers, and body heat to heat the building. These buildings make use of heat energy that conventional buildings may exhaust outside. They may use heat recovery ventilation, hot water heat recycling, combined heat and power, and absorption chiller units. ZEBs harvest available energy to meet their electricity and heating or cooling needs. By far the most common way to harvest energy is to use roof-mounted solar photovoltaic panels that turn the sun's light into electricity. Energy can also be harvested with solar thermal collectors (which use the sun's heat to heat water for the building). Heat pumps either ground-source (otherwise known as geothermal) or air-sourced can also harvest heat and cool from the air or ground near the building. Technically heat pumps move heat rather than harvest it, but the overall effect in terms of reduced energy use and reduced carbon footprint is similar. In the case of individual houses, various microgeneration technologies may be used to provide heat and electricity to the building, using solar cells or wind turbines for electricity, and biofuels or solar thermal collectors linked to a seasonal thermal energy storage (STES) for space heating. An STES can also be used for summer cooling by storing the cold of winter underground. To cope with fluctuations in demand, zero energy buildings are frequently connected to the electricity grid, export electricity to the grid when there is a surplus, and drawing electricity when not enough electricity is being produced. Other buildings may be fully autonomous. Energy harvesting is most often more effective (in cost and resource utilization) when done on a local but combined scale, for example, a group of houses, cohousing, local district, village, etc. rather than an individual basis. An energy benefit of such localized energy harvesting is the virtual elimination of electrical transmission and electricity distribution losses. On-site energy harvesting such as with roof top mounted solar panels eliminates these transmission losses entirely. Energy harvesting in commercial and industrial applications should benefit from the topography of each location. However, a site that is free of shade can generate large amounts of solar powered electricity from the building's roof and almost any site can use geothermal or air-sourced heat pumps. The production of goods under net zero fossil energy consumption requires locations of geothermal, microhydro, solar, and wind resources to sustain the concept. One of the key areas of debate in zero energy building design is over the balance between energy conservation and the distributed point-of-use harvesting of renewable energy (solar energy, wind energy and thermal energy). Most zero energy homes use a combination of these strategies. As a result of significant government subsidies for photovoltaic solar electric systems, wind turbines, etc., there are those who suggest that a ZEB is a conventional house with distributed renewable energy harvesting technologies. Entire additions of such homes have appeared in locations where photovoltaic (PV) subsidies are significant, but many so called "Zero Energy Homes" still have utility bills. This type of energy harvesting without added energy conservation may not be cost effective with the current price of electricity generated with photovoltaic equipment (depending on the local price of power company electricity),. The cost, energy and carbon-footprint savings from conservation (e.g., added insulation, triple-glazed windows and heat pumps) compared to those from on-site energy generation (e.g., solar panels) have been published for an upgrade to an existing house here. Since the 1980s, passive solar building design and passive house have demonstrated heating energy consumption reductions of 70% to 90% in many locations, without active energy harvesting. For new builds, and with expert design, this can be accomplished with little additional construction cost for materials over a conventional building. Very few industry experts have the skills or experience to fully capture benefits of the passive design. Such passive solar designs are much more cost-effective than adding expensive photovoltaic panels on the roof of a conventional inefficient building. A few kilowatt-hours of photovoltaic panels (costing 2 to 3 dollars per annual kWh production, U.S. dollar equivalent) may only reduce external energy requirements by 15% to 30%. A 100,000 BTU (110 MJ) high seasonal energy efficiency ratio 14 conventional air conditioner requires over 7 kW of photovoltaic electricity while it is operating, and that does not include enough for off-the-grid night-time operation. Passive cooling, and superior system engineering techniques, can reduce the air conditioning requirement by 70% to 90%. Photovoltaic-generated electricity becomes more cost-effective when the overall demand for electricity is lower. The energy used in a building can vary greatly depending on the behavior of its occupants. The acceptance of what is considered comfortable varies widely. Studies of identical homes have shown dramatic differences in energy use in a variety of climates. An average widely accepted ratio of highest to lowest energy consumer in identical homes is about 3, with some identical homes using up to 20 times as much heating energy as the others . Occupant behavior can vary from differences in setting and programming thermostats, varying levels of illumination and hot water use, window and shading system operation and the amount of miscellaneous electric devices or plug loads used. Utility companies are typically legally responsible for maintaining the electrical infrastructure that brings power to our cities, neighborhoods, and individual buildings. Utility companies typically own this infrastructure up to the property line of an individual parcel, and in some cases own electrical infrastructure on private land as well. Utilities have expressed concern that the use of Net Metering for ZNE projects threatens the Utilities base revenue, which in turn impacts their ability to maintain and service the portion of the electrical grid that they are responsible for. Utilities have expressed concern that states that maintain Net Metering laws may saddle non-ZNE homes with higher utility costs, as those homeowners would be responsible for paying for grid maintenance while ZNE home owners would theoretically pay nothing if they do achieve ZNE status. This creates potential equity issues, as currently, the burden would appear to fall on lower-income households. A possible solution to this issue is to create a minimum base charge for all homes connected to the utility grid, which would force ZNE home owners to pay for grid services independently of their electrical use. Additional concerns exist that local distribution as well as larger transmission grids have not been designed to convey electricity in two directions, which may be necessary as higher levels of distributed energy generation come on line. Overcoming this barrier could require extensive upgrades to the electrical grid, however this is not believed to be a major problem until renewable generation reaches much higher levels of penetration than currently realized. Wide acceptance of zero-energy building technology may require more government incentives or building code regulations, the development of recognized standards, or significant increases in the cost of conventional energy. The Google photovoltaic campus and the Microsoft 480-kilowatt photovoltaic campus relied on U.S. Federal, and especially California, subsidies and financial incentives. California is now providing US$3.2 billion in subsidies for residential-and-commercial near-zero-energy buildings. The details of other American states' renewable energy subsidies (up to US$5.00 per watt) can be found in the Database of State Incentives for Renewables and Efficiency. The Florida Solar Energy Center has a slide presentation on recent progress in this area. Those who commissioned construction of passive houses and zero-energy homes (over the last three decades) were essential to iterative, incremental, cutting-edge, technology innovations. Much has been learned from many significant successes, and a few expensive failures. The zero-energy building concept has been a progressive evolution from other low-energy building designs. Among these, the Canadian R-2000 and the German passive house standards have been internationally influential. Collaborative government demonstration projects, such as the superinsulated Saskatchewan House, and the International Energy Agency's Task 13, have also played their part. Applying this U.S. Government Net Zero classification system means that every building "can" become Net Zero with the right combination of the key Net Zero Technologies - PV (solar), GHP (geothermal heating and cooling, thermal batteries), EE (energy efficiency), sometimes Wind, and Electric Batteries. A graphical exposé of the scale of impact of applying these NREL guidelines for Net Zero can be seen in the graphic at Net Zero Foundation titled "Net Zero Effect on U.S. Total Energy Use" showing a possible 39% U.S. total fossil fuel use reduction by changing U.S. Residential and Commercial buildings to Net Zero, 37% savings if we still use Nat. Gas for cooking at the same level. Many well known universities have professed to want to completely convert their energy systems off of fossil fuels. The very idea that one could convert a whole campus off of fossil fuels has to date only been theoretical. Capitalizing on the continuing developments in both Photovoltaics and Geothermal heat pump technologies, and in the advancing Electric Battery field, complete conversion to a carbon free energy solution is now possible. An example of this is in the Net Zero Foundation's proposal at MIT to take that campus completely off fossil fuel use. This proposal shows the coming application of Net Zero Energy Buildings technologies at the District Energy scale. initial costs can be higher – effort required to understand, apply, and qualify for ZEB subsidies, if they exist. challenge to recover higher initial costs on resale of building, but new energy rating systems are being introduced gradually. solar energy capture using the house envelope only works in locations unobstructed from the sun. The solar energy capture cannot be optimized in north (for northern hemisphere, or south for southern Hemisphere) facing shade, or wooded surroundings. The goal of green building and sustainable architecture is to use resources more efficiently and reduce a building's negative impact on the environment. Zero energy buildings achieve one key green-building goal of completely or very significantly reducing energy use and greenhouse gas emissions for the life of the building. Zero energy buildings may or may not be considered "green" in all areas, such as reducing waste, using recycled building materials, etc. However, zero energy, or net-zero buildings do tend to have a much lower ecological impact over the life of the building compared with other "green" buildings that require imported energy and/or fossil fuel to be habitable and meet the needs of occupants. Because of the design challenges and sensitivity to a site that are required to efficiently meet the energy needs of a building and occupants with renewable energy (solar, wind, geothermal, etc. ), designers must apply holistic design principles, and take advantage of the free naturally occurring assets available, such as passive solar orientation, natural ventilation, daylighting, thermal mass, and night time cooling. Between 2008 and 2013, researchers from Australia, Austria, Belgium, Canada, Denmark, Finland, France, Germany, Italy, Republic of Korea, New Zealand, Norway, Portugal, Singapore, Spain, Sweden, Switzerland, United Kingdom and USA were working together in the joint research program “Towards Net Zero Energy Solar Buildings” under the umbrella of International Energy Agency (IEA) Solar Heating and Cooling Program (SHC) Task 40 / Energy in Buildings and Communities (EBC, formerly ECBCS) Annex 52 in order to bring the Net ZEB concept to market viability. The joint international research and demonstration activities are divided in subtasks. The objective is to develop a common understanding, a harmonized international applicable definition framework (Subtask A, see definitions methodology “Net Zero Energy Building” above), design process tools (Subtask B), advanced building design and technology solutions and industry guidelines for Net ZEBs (Subtask C). The scope encompasses new and existing residential and non-residential buildings located within the climatic zones of the participating countries. In Australia, researchers have recently developed a new approach to the construction of visually-clear solar energy harvesting windows suitable for industrialization and applications in net-zero energy buildings. Industrial production of several prototype batches of solar windows has started in 2016. Up to the December 2017, the State of Queensland has more than 30% of households with rooftop solar photovoltaic (PV) system. The average size of Australian rooftop solar PV system has exceeded 3.5kW. In Brisbane (capital city of Queensland), households with 6kW rooftop PV system and reasonable energy rating (5~6 stars for Australian National House Energy Rating NatHERS) can achieve net zero total energy target or even positive energy. In Belgium there is a project with the ambition to make the Belgian city Leuven climate-neutral in 2030. After April 2011 Fukushima earthquake follow up with Fukushima Daiichi nuclear disaster, Japan experienced severe　power crisis that led to the awareness of importance of energy conservation. In 2012 Ministry of Economy, Trade and Industry, Ministry of Land, Infrastructure, Transport and Tourism and Ministry of the Environment (Japan) summarized the road map for Low-carbon Society which contains the goal of ZEH and ZEB to be standard of new construction in 2020. In December 2017, the BC Energy Step Code entered into legal force in British Columbia. Local British Columbia governments may use the standard to incentivize or require a level of energy efficiency in new construction that goes above and beyond the requirements of the base building code. The regulation is designed as a technical roadmap to help the province reach its target that all new buildings will attain a net zero energy ready level of performance by 2032. In August 2017, the Government of Canada released Build Smart - Canada's Buildings Strategy, as a key driver of the Pan Canadian Framework on Clean Growth and Climate Change, Canada's national climate strategy. The Build Smart strategy seeks to dramatically increase the energy efficiency of Canadian buildings in pursuit of a net zero energy ready level of performance. In May 3 2013, Prime Minister Harper announced funding for ecoENERGY Innovation Initiative projects including a project being led by Owens Corning entitled Integrating Renewables and Conservation Measures in a Net-Zero Energy Low-Rise Residential Subdivision. This demonstration project aimed to address challenges specific to production housing when building to net zero energy performance levels. The buildABILITY Corporation project management team will be working to assess and resolve challenges in relation to site planning, construction, equipment, grid connections, cost, trade capability, warranty, reliability, sales, marketing, and homebuyer information/education. Five home builders across four provinces will build at least 25 Net Zero Energy (NZE) homes by March 2016 as part of this project. The five selected builders participating in this initiative are: Mattamy Homes Limited (Calgary, Alberta); Construction Voyer (Laval, Quebec); Minto Communities (Ottawa, Ontario); Provident Development Inc. (Halifax, Nova Scotia); and Reid’s Heritage Homes (Guelph, Ontario). The EcoTerra House in Eastman, Quebec is Canada's first nearly net-zero energy housing built through the CMHC EQuilibrium Sustainable Housing Competition. The house was designed by Assoc. Prof. Dr. Masa Noguchi of the University of Melbourne for Alouette Homes and engineered by Prof. Dr. Andreas K. Athienitis of Concordia University. In 2014, the public library building in Varennes, QC, became the first ZNE institutional building in Canada. The library is also LEED gold certified. The EcoPlusHome in Bathurst, New Brunswick. The Eco Plus Home is a prefabricated test house built by Maple Leaf Homes and with technology from Bosch Thermotechnology. The first net-zero passive house in Northshore, Vancouver, BC, is designed by Dr. Homayoun Arbabian. The design and construction of this SuperEcoHouse is undertaken by Vancouver Green Homes LTD.
One example of the new generation of zero energy office buildings is the 71-story Pearl River Tower, which opened in 2009, as the China National Tobacco Corporation headquarters. It uses both modest energy efficiency, and a big distributed renewable energy generation from both solar and wind. Designed by Skidmore Owings Merrill LLP in Guangzhou, China, the tower is receiving economic support from government subsidies that are now funding many significant conventional fossil-fuel (and nuclear energy) energy reduction efforts. Strategic Research Centre on Zero Energy Buildings was in 2009 established at Aalborg University by a grant from the Danish Council for Strategic Research (DSF), the Programme Commission for Sustainable Energy and Environment, and in cooperation with the Technical University of Denmark, Danish Technological Institute, Danfoss A/S, Velux A/S, Saint Gobain Isover A/S, and The Danish Construction Association, the section of aluminium facades. The purpose of the centre is through development of integrated, intelligent technologies for the buildings, which ensure considerable energy conservations and optimal application of renewable energy, to develop zero energy building concepts. In cooperation with the industry, the centre will create the necessary basis for a long-term sustainable development in the building sector. India's first net zero building is Indira Paryavaran Bhawan, located in New Delhi, inagurated in 2014. Features include passive solar building design and other green technologies. High-efficiency solar panels are proposed. It cools air from toilet exhaust using a heat recovery wheel in order to reduce load on its chiller system. It has many water conservation features. In 2011, Payesh Energy House (PEH) or Khaneh Payesh Niroo by a collaboration of Fajr-e-Toseah Consultant Engineering Company and Vancouver Green Homes Ltd] under management of Payesh Energy Group (EPG) launched the first Net-Zero passive house in Iran. This concept makes the design and construction of PEH a sample model and standardized process for mass production by MAPSA. Also an example of the new generation of zero energy office buildings is the 24-story OIIC Office Tower, which is started in 2011, as the OIIC Company headquarters. It uses both modest energy efficiency, and a big distributed renewable energy generation from both solar and wind. It is managed by Rahgostar Naft Company in Tehran, Iran. The tower is receiving economic support from government subsidies that are now funding many significant fossil-fuel-free efforts. In 2005, Scandinavian Homes launched the world's first standardised passive house in Ireland, this concept makes the design and construction of passive house a standardised process. Conventional low energy construction techniques have been refined and modelled on the PHPP (Passive House Design Package) to create the standardised passive house. Building offsite allows high precision techniques to be utilised and reduces the possibility of errors in construction. In 2012 Cork institute of Technology started renovation work on its 1974 building stock to develop a net zero energy building retrofit. The exemplar project will become Ireland's first zero energy testbed offering a post occupancy evaluation of actual building performance against design benchmarks. In October 2007, the Malaysia Energy Centre (PTM) successfully completed the development and construction of the PTM Zero Energy Office (ZEO) Building. The building has been designed to be a super-energy-efficient building using only 286 kWh/day. The renewable energy – photovoltaic combination is expected to result in a net zero energy requirement from the grid. The building is currently undergoing a fine tuning process by the local energy management team. Findings are expected to be published in a year. In 2016,The Sustainable Energy Development Authority Malaysia (SEDA Malaysia) has started a voluntary initiative called Low Carbon Building Facilitation Program. The purpose is to support the current low carbon cities program in Malaysia. Under the program, several project demonstration managed to reduce energy and carbon beyond 50% savings and some managed to save more than 75%. Continuous improvement of super energy efficient buildings with significant implementation of on-site renewable energy managed to made a few of them become nearly Zero Energy (nZEB) as well as Net Zero Energy Building (NZEB). In March 2018, SEDA Malaysia has started the Zero Energy Building Facilitation Program. Malaysia also have its own sustainable building tool special for Low Carbon and zero energy building, called GreenPASS that been developed by the Construction Industry Development Board Malaysia (CIDB) in 2012, and currently being administered and promoted by SEDA Malaysia. GreenPASS official be called the Construction Industry Standard (CIS) 20:2012. In September 2006, the Dutch headquarters of the World Wildlife Fund (WWF) in Zeist was opened. This earth-friendly building gives back more energy than it uses. All materials in the building were tested against strict requirements laid down by the WWF and the architect. Singapore's first zero-energy building was launched at the inaugural Singapore Green Building Week. The Swiss MINERGIE-A-Eco label certifies zero energy buildings. The first building with this label, a single-family home, was completed in Mühleberg in 2011. In December 2006, the government announced that by 2016 all new homes in England will be zero energy buildings. To encourage this, an exemption from Stamp Duty Land Tax is planned. In Wales the plan is for the standard to be met earlier in 2011, although it is looking more likely that the actual implementation date will be 2012. However, as a result of a unilateral change of policy published at the time of the March 2011 budget, a more limited policy is now planned which, it is estimated, will only mitigate two thirds of the emissions of a new home. In the US, ZEB research is currently being supported by the US Department of Energy (DOE) Building America Program, including industry-based consortia and researcher organizations at the National Renewable Energy Laboratory (NREL), the Florida Solar Energy Center (FSEC), Lawrence Berkeley National Laboratory (LBNL), and Oak Ridge National Laboratory (ORNL). From fiscal year 2008 to 2012, DOE plans to award $40 million to four Building America teams, the Building Science Corporation; IBACOS; the Consortium of Advanced Residential Buildings; and the Building Industry Research Alliance, as well as a consortium of academic and building industry leaders. The funds will be used to develop net-zero-energy homes that consume 50% to 70% less energy than conventional homes. The 2008 Solar America Initiative funded research and development into future development of cost-effective Zero Energy Homes in the amount of $148 million in 2008. By Executive Order 13514, U.S. President Barack Obama mandated that by 2015, 15% of existing Federal buildings conform to new energy efficiency standards and 100% of all new Federal buildings be Zero-Net-Energy by 2030. In 2007, the philanthropic Siebel Foundation created the Energy Free Home Foundation. The goal was to offer $20 million in global incentive prizes to design and build a 2,000 square foot (186 square meter) three-bedroom, two bathroom home with (1) net-zero annual utility bills that also has (2) high market appeal, and (3) costs no more than a conventional home to construct. The plan included funding to build the top ten entries at $250,000 each, a $10 million first prize, and then a total of 100 such homes to be built and sold to the public. Beginning in 2009, Thomas Siebel made many presentations about his Energy Free Home Challenge. The Siebel Foundation Report stated that the Energy Free Home Challenge was "Launching in late 2009". The Lawrence Berkeley National Laboratory at the University of California, Berkeley participated in writing the "Feasibility of Achieving Zero-Net-Energy, Zero-Net-Cost Homes" for the $20-million Energy Free Home Challenge. If implemented, the Energy Free Home Challenge would have provided increased incentives for improved technology and consumer education about zero energy buildings coming in at the same cost as conventional housing. The U.S. Department of Energy Solar Decathlon is an international competition that challenges collegiate teams to design, build, and operate the most attractive, effective, and energy-efficient solar-powered house. Achieving Zero Net Energy balance is a major focus of the competition. The State of California has proposed that all new low- and mid-rise residential buildings, and all new commercial buildings, be designed and constructed to ZNE standards beginning in 2020 and 2030, respectively. The requirements, if implemented, will be promulgated via the California Building Code, which is updated on a three-year cycle and which currently mandates some of the highest energy efficiency standards in the United States. California is anticipated to further increase efficiency requirements by 2020, thus avoiding the trends discussed above of building standard housing and achieving ZNE by adding large amounts of renewables. The California Energy Commission is required to perform a cost-benefit analysis to prove that new regulations create a net benefit for residents of the state. There has yet to be publicly released analysis of the impact that ZNE standards may have to construction, real estate, and energy prices in the state. Debate exists as to if the state's stringent efficiency requirements are directly responsible for the apparent "flatlining" of residential electricity use in the state since 1975. This debate is relevant to ZNE codes, as it remains to be seen via models or in practice what overall effect the proliferation of ZNE buildings will have on overall electricity use in the state, and at what cost. West Village, located on the University of California campus in Davis, California, was the largest ZNE-planned community in North America at the time of its opening in 2014. The development contains student housing for approximately 1,980 UC Davis students as well as leasable office space and community amenities including a community center, pool, gym, restaurant and convenience store. Office spaces in the development are currently leased by energy and transportation-related University programs. The project was a public-private partnership between the university and West Village Community Partnership LLC, led by Carmel Partners of San Francisco, a private developer, who entered into a 60-year ground lease with the university and was responsible for the design, construction, and implementation of the $300 million project, which is intended to be market-rate housing for Davis. This is unique as the developer designed the project to achieve ZNE at no added cost to themselves or to the residents. Designed and modeled to achieve ZNE, the project uses a mixture of passive elements (roof overhangs, well-insulated walls, radiant heat barriers, ducts in insulated spaces, etc.) as well as active approaches (occupancy sensors on lights, high-efficiency appliances and lighting, etc.). Designed to out-perform California's 2008 Title 24 energy codes by 50%, the project produced 87% of the energy it consumed during its first year in operation. The shortcoming in ZNE status is attributed to several factors, including improperly functioning heat pump water heaters, which have since been fixed. Occupant behavior is significantly different than anticipated, with the all-student population using more energy on a per-capita basis than typical inhabitants of single-family homes in the area. One of the primary factors driving increased energy use appears to be the increased miscellaneous electrical loads (MEL, or plug loads) in the form of mini-refrigerators, lights, computers, gaming consoles, televisions, and other electronic equipment. The university continues to work with the developer to identify strategies for achieving ZNE status. These approaches include incentivizing occupant behavior and increasing the site's renewable energy capacity, which is a 4 MW photovoltaic array per the original design. The West Village site is also home to the Honda Smart Home US, a beyond-ZNE single-family home that incorporates cutting-edge technologies in energy management, lighting, construction, and water efficiency. The IDeAs Z2 Design Facility is a net zero energy, zero carbon retrofit project occupied since 2007. It uses less than one fourth the energy of a typical U.S. office by applying strategies such as daylighting, radiant heating/cooling with a ground-source heat pump and high energy performance lighting and computing. The remaining energy demand is met with renewable energy from its building-integrated photovoltaic array. In 2009, building owner and occupant Integrated Design Associates (IDeAs) recorded actual measured energy use intensity of 21.17 kbtu/sf-year, with 21.72 kbtu/sf-year produced, for a net of −0.55 kbtu/sf-yr. The building is also carbon neutral, with no gas connection, and with carbon offsets purchased to cover the embodied carbon of the building materials used in the renovation. 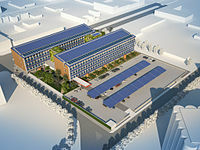 The Zero Net Energy Center, scheduled to open in 2013 in San Leandro, is to be a 46,000-square-foot electrician training facility created by the International Brotherhood of Electrical Workers Local 595 and the Northern California chapter of the National Electrical Contractors Association. Training will include energy-efficient construction methods. The Green Idea House is a net zero energy, zero-carbon retrofit in Hermosa Beach. George LeyVa Middle School Administrative Offices, occupied since fall 2011, is a net zero energy, net zero carbon emissions building of just over 9,000 square feet. With daylighting, variable refrigerant flow HVAC, and displacement ventilation, it is designed to use half of the energy of a conventional California school building, and, through a building-integrated solar array, provides 108% of the energy needed to offset its annual electricity use. The excess helps power the remainder of the middle school campus. It is the first publicly funded NZE K–12 building in California. The Stevens Library at Sacred Heart Schools in California is the first net-zero library in the United States, receiving Net Zero Energy Building status from the International Living Future Institute, part of the PG&E Zero Net Energy Pilot Project. The Moore House achieves net-zero energy usage with passive solar design, ‘tuned’ heat reflective windows, super-insulated and air-tight construction, natural daylighting, solar thermal panels for hot water and space heating, a photovoltaic (PV) system that generates more carbon-free electricity than the house requires, and an energy-recovery ventilator (ERV) for fresh air. The green building strategies used by Thomas Doerr of Doerr Architecture and Ecofutures Building on the Moore House earned it a verified home energy rating system (HERS) score of −3. The NREL Research Support Facility in Golden is an award-winning class A office building. Its energy efficiency features include: Thermal storage concrete structure, transpired solar collectors, 70 miles of radiant piping, high-efficiency office equipment, and an energy-efficient data center that reduces the data center's energy use by 50% over traditional approaches. Wayne Aspinall Federal Building in Grand Junction, originally constructed in 1918, became the first Net Zero Energy building listed on the National Register of Historic Places. On-site renewable energy generation is intended to produce 100% of the building's energy throughout the year using the following energy efficiency features: Variable refrigerant flow for the HVAC, a geo-exchange system, advanced metering and building controls, high-efficient lighting systems, thermally enhanced building envelope, interior window system (to maintain historic windows), and advanced power strips (APS) with individual occupancy sensors. Tutt Library at Colorado College was renovated to be a net-zero library in 2017, making it the largest ZNE academic library. It received an Innovation Award from the National Association of College and University Business Officers. The 1999 side-by-side Florida Solar Energy Center Lakeland demonstration project was called the "Zero Energy Home." It was a first-generation university effort that significantly influenced the creation of the U.S. Department of Energy, Energy Efficiency and Renewable Energy, Zero Energy Home program. The Walgreens store located on 741 Chicago Ave, Evanston, is the first of the company's stores to be built and or converted to a net zero energy building. It is the first net zero energy retail stores to be built and will pave the way to renovating and building net zero energy retail stores in the near future. The Walgreens store includes the following energy efficiency features: Geo-exchange system, energy-efficient building materials, LED lighting and daylight harvesting, and carbon dioxide refrigerant. The Electrical and Computer Engineering building at the University of Illinois at Urbana-Champaign, which was built in 2014, is a net zero building. The MUM Sustainable Living Center was designed to surpass LEED Platinum qualification. The Maharishi University of Management (MUM) in Fairfield, Iowa, founded by Maharishi Mahesh Yogi (best known for having brought Transcendental Meditation to the West) incorporates principles of Bau Biology (a German system that focuses on creating a healthy indoor environment), as well as Maharishi Vedic Architecture (an Indian system of architecture focused on the precise orientation, proportions and placement of rooms). The building is one of the few in the country to qualify as net zero, and one of even fewer that can claim the banner of grid positive via its solar power system. A rainwater catchment system and on-site natural waste-water treatment likewise take the building off (sewer) grid with respect to water and waste treatment. Additional green features include natural daylighting in every room, natural and breathable earth block walls (made by the program’s students), purified rainwater for both potable and non-potable functions; and an on-site water purification and recycling system consisting of plants, algae, and bacteria. Richardsville Elementary School, part of the Warren County Public School District in south central Kentucky, is the first Net Zero energy school in the United States. To reach Net Zero, innovative energy reduction strategies were used by CMTA Consulting Engineers and Sherman Carter Barnhart Architects including dedicated outdoor air systems (DOAS) with dynamic reset, new IT systems, alternative methods to prepare lunches, and the use of solar photovoltaics. The project has an efficient thermal envelope constructed with insulated concrete form (ICF) walls, geothermal water source heat pumps, low-flow fixtures, and features daylighting extensively throughout. It is also the first truly wireless school in Kentucky. Locust Trace AgriScience Center, an agricultural-based vocational school serving Fayette County Public Schools and surrounding districts, features a Net Zero Academic Building engineered by CMTA Consulting Engineers and designed by Tate Hill Jacobs Architects. The facility, located in Lexington, Kentucky, also has a greenhouse, riding arena with stalls, and a barn. To reach Net Zero in the Academic Building the project utilizes an air-tight envelope, expanded indoor temperature setpoints in specified areas to more closely model real-world conditions, a solar thermal system, and geothermal water source heat pumps. The school has further reduced its site impact by minimizing municipal water use through the use of a dual system consisting of a standard leach field system and a constructed wetlands system and using pervious surfaces to collect, drain, and use rainwater for crop irrigation and animal watering. The government of Cambridge has enacted a plan for "net zero" carbon emissions from all buildings in the city by 2040. John W. Olver Transit Center, designed by Charles Rose Architects Inc, is an intermodal transit hub in Greenfield, Massachusetts. Built with American Recovery and Reinvestment Act funds, the facility was constructed with solar panels, geothermal wells, copper heat screens and other energy efficient technologies. The Mission Zero House is the 110-year-old Ann Arbor home of Greenovation.TV host and Environment Report contributor Matthew Grocoff. As of 2011, the home is the oldest home in America to achieve net-zero energy. The owners are chronicling their project on Greenovation.TV and the Environment Report on public radio. The Lenawee Center for a Sustainable Future, a new campus for Lenawee Intermediate School District, serves as a living laboratory for the future of agriculture. It is the first Net Zero education building in Michigan, engineered by CMTA Consulting Engineers and designed by The Collaborative, Inc. The project includes solar arrays on the ground as well as the roof, a geothermal heating and cooling system, solar tubes, permeable pavement and sidewalks, a sedum green roof, and an overhang design to regulate building temperature. In 2010, architectural firm HOK worked with energy and daylighting consultant The Weidt Group to design a 170,735-square-foot (15,861.8 m2) net zero carbon emissions Class A office building prototype in St. Louis, Missouri. The team chronicled its process and results on Netzerocourt.com. The 31 Tannery Project, located in Branchburg, New Jersey, serves as the corporate headquarters for Ferreira Construction, the Ferreira Group, and Noveda Technologies. The 42,000-square-foot (3,900 m2) office and shop building was constructed in 2006 and is the first building in the state of New Jersey to meet New Jersey's Executive Order 54. The building is also the first Net Zero Electric Commercial Building in the United States. Green Acres, the first true zero-net energy development in America, is located in New Paltz, about 80 miles (130 km) north of New York City. Greenhill Contracting began construction on this development of 25 single family homes in summer 2008, with designs by BOLDER Architecture. After a full year of occupancy, from March 2009 to March 2010, the solar panels of the first occupied home in Green Acres generated 1490 kWh more energy than the home consumed. The second occupied home has also achieved zero-net energy use. As of June 2011, 5 houses have been completed, purchased and occupied, 2 are under construction, and several more are being planned. The homes are built of insulated concrete forms with spray foam insulated rafters and triple pane casement windows, heated and cooled by a geothermal system, to create extremely energy-efficient and long-lasting buildings. The heat recovery ventilator provides constant fresh air and, with low or no VOC (volatile organic compound) materials, these homes are very healthy to live in. To the best of our knowledge, Green Acres is the first development of multiple buildings, residential or commercial, that achieves true zero-net energy use in the United States, and the first zero-net energy development of single family homes in the world. Greenhill Contracting has built two luxury zero-net energy homes in Esopus, completed in 2008. One house was the first Energy Star rated zero-net energy home in the Northeast and the first registered zero-net energy home on the US Department of Energy's Builder's Challenge website. These homes were the template for Green Acres and the other zero-net energy homes that Greenhill Contracting has built, in terms of methods and materials. The headquarters of Hudson Solar, a dba of Hudson Valley Clean Energy, Inc., located in Rhinebeck and completed in 2007, was determined by NESEA (the Northeast Sustainable Energy Association) to have become the first proven zero-net energy commercial building in New York State and the ten northeast United States (October 2008). The building consumes less energy than it generates, using a solar electric system to generate power from the sun, geothermal heating and cooling, and solar thermal collectors to heat all its hot water. The first 5,000-square-foot (460 m2) zero-energy design home was built in 1979 with support from President Carter's new United States Department of Energy. It relied heavily on passive solar building design for space heat, water heat and space cooling. It heated and cooled itself effectively in a climate where the summer peak temperature was 110 degrees Fahrenheit, and the winter low temperature was −10 F. It did not use active solar systems. It is a double envelope house that uses a gravity-fed natural convection air flow design to circulate passive solar heat from 1,000 square feet (93 m2) of south-facing glass on its greenhouse through a thermal buffer zone in the winter. A swimming pool in the greenhouse provided thermal mass for winter heat storage. In the summer, air from two 24-inch (610 mm) 100-foot-long (30 m) underground earth tubes is used to cool the thermal buffer zone and exhaust heat through 7200 cfm of outer-envelope roof vents. Net Zero Energy Building Certification launched in 2011, with an international following. The first project, Painters Hall, is Pringle Creek’s Community Center, café, office, art gallery, and event venue. Originally built in the 1930s, Painters Hall was renovated to LEED Platinum Net Zero energy building standards in 2010, demonstrating the potential of converting existing building stock into high‐performance, sustainable building sites. Painters Hall features simple low-‐cost solutions for energy reduction, such as natural daylighting and passive cooling lighting, that save money and increase comfort. A district ground-source geothermal loop serves the building’s GSHP for highly efficient heating and air conditioning. Excess generation from the 20.2 kW rooftop solar array offsets pumping for the neighborhoods geo loop system. Open to the public, Painters Hall is a hub for gatherings of friends, neighbors, and visitors at the heart of a neighborhood designed around nature and community. The Phipps Center for Sustainable Landscapes in Pittsburgh was designed to be one of the greenest buildings in the world. It achieved Net Zero Energy Building Certification from the Living Building Challenge in February 2014 and is pursuing full certification. The Phipps Center uses energy conservation technologies such as solar hot water collectors, carbon dioxide sensors, and daylighting, as well as renewable energy technologies to allow it to achieve Net Zero Energy status. In Newport, the Paul W. Crowley East Bay MET School is the first Net Zero project to be constructed in Rhode Island. It is a 17,000 sq ft building, housing eight large classrooms, seven bathrooms and a kitchen. It will have PV panels to supply all necessary electricity for the building and a geothermal well which will be the source of heat. civitas, designed by archimania, Memphis, Tennessee. civitas is a case study home on the banks of the Mississippi River, currently under construction. It aims to embrace cultural, climatic, and economic challenges. The home will set a precedent for Southeastern high-performance design. The University of North Texas (UNT) was constructing a Zero Energy Research Laboratory on its 300-acre research campus, Discovery Park, in Denton, Texas. The project is funded at over $1,150,000 and will primarily benefit students in mechanical and energy engineering (UNT became the first university to offer degrees in mechanical and energy engineering in 2006). This 1,200-square-foot structure is now competed and held ribbon cutting ceremony for the University of North Texas’ Zero Energy Laboratory on April 20, 2012. The West Irving Library in Irving, TX, became the first net zero library in Texas in 2011, running entirely off solar energy. Since then it has produced a surplus. It has LEED gold certification. The Putney School's net zero Field House was opened October 10, 2009. In use for over a year, as of December 2010, the Field House used 48,374 kWh and produced a total of 51,371 kWh during the first 12 months of operation, thus performing at slightly better than net-zero. Also in December, the building won an AIA-Vermont Honor Award. The Charlotte Vermont House designed by Pill-Maharam Architects is a verified net zero energy house completed in 2007. The project won the Northeast Sustainable Energy Association's Net Zero Energy award in 2009. The Artemisia zero-energy cabin, in Winthrop, Washington, is believed to be the first net-zero-energy nightly vacation rental home in the United States. It was built by two Seattle couples. The home completed its first full year of rental occupancy in 2018, achieving its zero-energy goal. ^ "Zero Energy Buildings: A Critical Look at the Definition Paul Torcellini, Shanti Pless, Michael Deru National Renewable Energy Laboratory; Drury Crawley, U.S. Department of Energy. National Renewable Energy Laboratory report: NREL/CP-550-39833 June, 2006" (PDF). ^ "A Common Definition for Zero Energy Buildings" (PDF). US Department of Energy. September 2015. ^ a b ""Net-Zero Energy Buildings: A Classification System Based on Renewable Energy Supply Options." Shanti Pless and Paul Torcellini. National Renewable Energy Laboratory report: NREL/TP-5500-44586, June 2010" (PDF). ^ "Nearly Zero Energy Buildings". European Union. ^ a b Torcellini, P.; Pless, S.; Deru, M. (June 2006). "Zero Energy Buildings: A Critical Look at the Definition" (PDF). National Renewable Energy Laboratory. Retrieved June 25, 2014. ^ Nsaliwa, Dekhani; Vale, Robert; Isaacs, Nigel (2015-08-01). "Housing and Transportation: Towards a Multi-scale Net Zero Emission Housing Approach for Residential Buildings in New Zealand". Energy Procedia. Clean, Efficient and Affordable Energy for a Sustainable Future: The 7th International Conference on Applied Energy (ICAE2015). 75: 2826–2832. doi:10.1016/j.egypro.2015.07.560. ^ a b "Net Zero Energy Solar Buildings". International Energy Agency: Solar Heating and Cooling Programme. 2014. Retrieved 25 June 2014. ^ Voss, Karsten; Musall, Eike (2012): Net zero energy buildings – International projects of carbon neutrality in buildings. 2nd edition. Institut für Internationale Architektur-Dokumentation, München, ISBN 978-3-920034-80-5. ^ Vieira, R., "The Energy Policy Pyramid – A Hierarchal Tool For Decision Makers"., Fifteenth Symposium on Improving Building Systems in Hot and Humid Climates, July 24–26, 2006 Orlando, Florida. ^ a b Spiegel, Jan Allen. "The House that Green Built." New York Times. 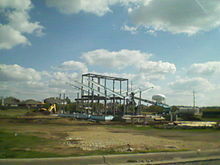 20 April 2008. Last retrieved: 15 December 2013. ^ "Renewable Energy Has a Variability Problem". The Green Economy Post: Green Careers, Green Business, Sustainability. 2010-11-30. Retrieved 2016-03-04. ^ "Go Solar California". www.gosolarcalifornia.ca.gov. ^ "Energy: The Grand Challenge of the 21st Century" (PDF). ^ Goyal, K. K. (July 14, 2009). Renewable Energy. New Delhi: Mahaveer & Sons. p. Influential Zero-and Low-Energy Buildings. ISBN 978-81-8377-243-3. Retrieved 18 September 2015. ^ "Net Zero Foundation". netzerofoundation.org. ^ "100% Net Zero Carbon Plan, 60% NZ Effectively Free, Expert Team Ready! - MIT Climate Mitigation Solutions 2016 - Climate CoLab". Climate CoLab. ^ "Building Energy Rating Ireland". Buildingenergyireland.ie. Retrieved 25 June 2014. ^ Ken, Edelstein. "Net Zero Energy is dead, long live Zero Energy". Kendeda Living Building Chronicle. The Kendeda Fund. Retrieved 3 July 2017. ^ Vasiliev, M. et al. Photonic microstructures for energy-generating clear glass and net-zero energy buildings. Sci. Rep. 6, 31831; doi: 10.1038/srep31831 (2016). ^ Victor Rosenberg (24 August 2016). "ClearVue power generating glass 5 fans" – via YouTube. ^ W. Miller, A. L. Liu, Z. Amin, and M. Gray, "Involving Occupants in Net Zero Energy Solar Housing Retrofits: an Australian Sub-tropical Case Study," Solar Energy, 2018. ^ "Integrating Renewables and Conservation Measures in a Net-Zero Energy Low-Rise Residential Subdivision". www.nrcan.gc.ca. ^ "Net-Zero Energy Home (NZEH) Coalition, Canada". ^ "EQuilibrium™ Housing - CMHC". CMHC. ^ "EcoTerra House". Canadian Home Builders' Association. ^ "Varennes Net-Zero Library - Award of Excellence - Canadian Consulting Engineer". Canadian Consulting Engineer. Retrieved 2018-02-23. ^ "EcoPlusHome". ecoplushome.com. 2014. Retrieved 25 June 2014. ^ "Skidmore, Owings & Merrill Pearl River Tower". University of Brighton. ^ "DOE Solar Decathlon: Final Results:First Place: Technische Universität Darmstadt". ^ "Fehlerseite 404 - Fraunhofer ISE". Fraunhofer-Institut für Solare Energiesysteme ISE. ^ "Prime Minister Inaugurates "Indira Paryavaran Bhawan". Bhawan is India's First on Site Net Zero Building". Press Information Bureau, Government of India. 25 February 2014. Retrieved 23 May 2014. ^ "Fajr-e-Tosea Consulting Engineers Co". fajr-t.com. 2014. Retrieved 25 June 2014. ^ "Oil Industry Investment Company". oiic-ir.com. 2014. Retrieved 25 June 2014. ^ "شرکت ره گستر نفت". Oiic-ir.com. Retrieved 25 June 2014. ^ "Scandinavian Homes Ltd, Research". ^ "zero2020energyhtml". Zero2020energy.com. Retrieved 25 June 2014. ^ Steve Lojuntin (2018-03-11). "Zero Energy Building in Malaysia by SEDA Malaysia". ^ "Singapore's First Zero Energy Building Launched at the Inaugural Singapore Green Building Week" (PDF). ^ von Muralt, Klaus (5 June 2011). "Mit "Nullenergie" in eine klimabewusste Zukunft". Der Bund. Retrieved 5 June 2011. ^ "Building America: Bringing Building Innovations to Market - Department of Energy". www.buildingamerica.gov. ^ a b "U.S. DOE – 2007 Solar Decathlon Closing Ceremony and Awards". October 2007. Retrieved 2008-04-14. ^ "U.S. Energy Independence and Security Act of 2007". Retrieved 2007-12-23. ^ "Budget of the United States Government, FY 2008: DEPARTMENT OF ENERGY". ^ "Fact Sheet: President Bush Signs Into Law a National Energy Plan". georgewbush-whitehouse.archives.gov. ^ "2008 Siebel Foundation Report" (PDF). ^ S., Al-Beaini (26 February 2010). "Feasibility of Achieving a Zero-Net-Energy, Zero-Net-Cost Homes". ^ "California Energy Efficiency Strategic Plan" (PDF). California Energy Commission. Retrieved March 3, 2016. ^ "Energy Efficiency Strategic Plan". www.cpuc.ca.gov. Retrieved 2016-03-04. ^ Levinson, Arik (2013-01-01). "California Energy Efficiency: Lessons for the Rest of the World, or Not?". Georgetown University, Department of Economics. ^ a b "Home | UC Davis West Village". westvillage.ucdavis.edu. Retrieved 2016-03-04. ^ Honda. "Honda Smart Home US". Honda Smart Home US. Retrieved 2016-03-04. ^ "ASHRAE: Atlanta, Georgia:High Performance Buildings Case Study" (PDF). ^ "Energy Information Administration (EIA)- Commercial Buildings Energy Consumption Survey (CBECS)" (PDF). www.eia.doe.gov. ^ "Assemblywoman Mary Hayashi to Present Resolution to Red Top Electric". prweb.com. 15 October 2012. ^ Wyatt, John (6 November 2012). "A Good Idea". wconline.com. Wall and Ceiling Magazine. Retrieved January 21, 2013. ^ "Sacred Heart Stevens Net-Zero Library: First In The U.S. To Achieve Net Zero Energy Building Certification". WRNS Studio. Retrieved 2018-02-23. ^ Doerr, Thomas (2012). Passive Solar Simplified. Retrieved October 24, 2012. ^ "Case Studies: Net-Zero Energy House in Evergreen, Colorado". Doerr.org. Retrieved 25 June 2014. ^ a b c "Net Zero Examples". Sustainable Facilities Tool. The Office of Federal High-Performance Green Buildings. Retrieved 1 October 2015. ^ "CC's Net-Zero Energy Library Opens • Colorado College". www.coloradocollege.edu. Retrieved 2018-02-23. ^ "ZEH: Lakeland, FL". www.fsec.ucf.edu. ^ "Institut für Baubiologie + Nachhaltigkeit IBN". Institut für Baubiologie + Nachhaltigkeit IBN. ^ "Net Zero Is Bliss At Maharishi University In Iowa - EarthTechling". www.earthtechling.com. ^ "The Ultimate Green Building A building that gives back to the environment". ^ Cambridge, City of. "Net Zero Action Plan - CDD - City of Cambridge, Massachusetts". www.cambridgema.gov. ^ "'Mission Zero' achieved in Ann Arbor". ^ "America's Oldest Net Zero Solar House - Old House Web Blog". www.oldhouseweb.com. ^ Koch, Wendy (11 June 2010). "110-Year-Old Home Gets Net Zero Energy Rehab". USA Today. ^ "Green Builder Magazine, December 2009 Pages 31–34". ^ "Lenawee ISD Opens High-Tech Education Showplace". 10 June 2013. ^ "Zero Energy Design ABUNDANT ENERGY In Harmony With Nature". Retrieved 2011-03-27. ^ "Phipps Conservatory - Center for Sustainable Landscapes". Phipps Conservatory. Archived from the original on 11 November 2011. Retrieved 1 July 2014. ^ "Net Zero Examples - GSA Sustainable Facilities Tool". SFTool.gov. Retrieved 1 July 2014. ^ "What It Takes to Go Net-Zero". www.architectmagazine.com. October 5, 2017. Retrieved 2018-06-21. ^ "UNT to build Zero Energy Research Laboratory". University of North Texas. 30 June 2011. Retrieved 25 June 2014. ^ "Lab designed to study green energy technologies completed at UNT". University of North Texas. 10 April 2012. Retrieved 25 June 2014. ^ "Irving Library Operates on Solar Power". NBC 5 Dallas-Fort Worth. Retrieved 2018-02-23. ^ "Irving West Library - DFW Solar Home Tour". dfwsolartour.org. Retrieved 2018-02-23. ^ "Putney School's Net-Zero Fieldhouse Is Net-Zero". The Putney School. ^ "AIA-Vermont Honor Award". The Putney School. ^ "Zero Energy 2009 Winner". Northeast Sustainable Energy Association. Nisson, J. D. Ned; and Gautam Dutt, "The Superinsulated Home Book", John Wiley & Sons, 1985, ISBN 978-0-471-88734-8, ISBN 978-0-471-81343-9. Markvart, Thomas; Editor, "Solar Electricity" John Wiley & Sons; 2nd edition, 2000, ISBN 978-0-471-98853-3. Clarke, Joseph; "Energy Simulation in Building Design", Second Edition Butterworth-Heinemann; 2nd edition, 2001, ISBN 978-0-7506-5082-3. Voss, Karsten; Musall, Eike: "Net zero energy buildings – International projects of carbon neutrality in buildings", Munich, 2011, ISBN 978-3-920034-80-5.